I was showered with gluten free treats for my birthday and I would be remiss to not give shout outs to my friends who gave them to me! I went to school on Thursday, the day before my birthday, with every intention of skipping classes on Friday, March 13th. I mean, who wants to sit in class on their birthday? Luckily my class schedule worked out so I didn't miss anything important. My friends knew of my devious plan so I was welcomed to school with a delicious tray of Whole Food's GF Walnut Brownies from Lauren and Nathan. At lunch I was met by Heather and Amy with another set of desserts from the Whole Foods Gluten Free Bakehouse -- peanut butter cookies. They were delicious and I think I ate them in about ten minutes. On Tuesday my friend Sarah and I left for Palm Springs and had a wonderful time. She brought along tons of gluten free snacks from Trader Joe's, including Trader Joe's GF Granola, which I previously posted about. 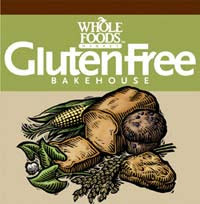 She also brought along some great GF popped chips from Trader Joe's, and I was happy to see that they were well-marked with the "No Gluten Ingredients" label that is so helpful to us Celiacs. I received another great package from my friend Jeff in D.C. Jeff knows that I love ThinkThin bars after traveling with me through Israel last summer. He saw me suffer through endless McDonald's as everybody else ate their falafel...and by suffer I mean live off McFlurrys. Not such a bad life. So Jeff sent me some ThinkThin bars along with a package of Trader Joe's dark chocolate mixed nuts! He also sent me a delicious mocha chocolate bar snack from TJ's, conveniently marked "No Gluten Ingredients" as well. And last but certainly not least, my friend Ashley sent me a delicious Edible Arrangement! My roommate Vanessa and I are still working on the arrangement because it was HUGE. I must admit, I had always been wary of giving an Edible Arrangement to somebody as a gift. However, after this experience, I'm hooked. 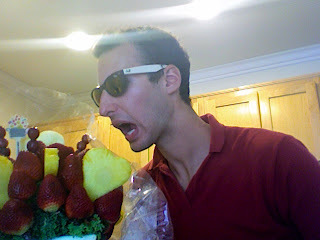 The fruit was fresh, the local Edible Arrangement shop (there is one right in Downtown L.A. by 7th & Figueroa) was incredibly helpful in working out a delivery time, and it was an enormous arrangement. Thanks to everybody for all of the great GF snacks!!! You made this birthday great. GO ROBEKS! Email this post to Rob!